BBC NEWS | UK | Magazine | How do trains get names? How do trains get names? 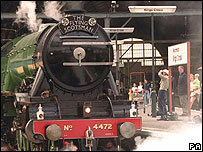 The late poet and railway enthusiast Sir John Betjeman is having a train named after him. But how do trains normally get names? What have Michael Palin, Dr Who, Lady Penelope and Brookside got in common? They've all had trains named in their honour. And now the late poet Sir John Betjeman, the laureate of the melancholy railway ride, has had a train named after him - with a ceremony held on Friday at London's Liverpool Street Station. The poet caught the romance of train travel in the English countryside and the sprawling suburbs - and the train named after him will operate on the route between London and Norwich, a trip reflected in the poem A Mind's Journey to Diss. But how do trains - and more precisely, locomotives that pull trains - get names? 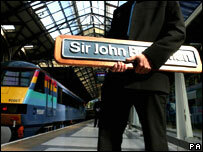 Every time you go through a mainline station, you see these nameplates - but who decides what they should be called? The tradition of naming trains is as old as the railways - back to the 1820s and George Stephenson's Rocket. This followed in the convention of naming ships - and gave an extra sense of character to the technology. Catching the Flying Scotsman sounds more of an event than the 11.37 from King's Cross. Before the railways were nationalised as British Rail, companies such as Southern, Great Western and LNER had their own themes, such as naming trains after racehorses, schools, Arthurian characters or famous castles. Then, as now, names were decided upon informally by the individual companies, without any official process. And there have been all kinds of weird, wonderful and even downright dull selections. Dr Who appears on the nameplate of one of Virgin's Voyager trains - along with other explorers including Christopher Columbus, Marco Polo, Yuri Gagarin, Sir Walter Raleigh and that other great historical figure, Michael Palin. Does it make a difference? If you were travelling on the Captain Robert Scott or Sir Ernest Shackleton would you be less inclined to feel the cold? "It adds a little romance and gives something extra - or maybe gives a flavour of an area," says Virgin spokesperson, Lee West. For instance, in Cornwall, Virgin's train has a Cornish name - Vyajer Kernewek. The naming theme was taken even further with Virgin's rescue locos - which retrieve broken-down trains. These have been named after Thunderbirds characters - Lady Penelope, Tracy Island, Brains, Fab 1, Parker and so on. The company that makes many of the modern nameplates is Newton Replicas in Nottingham. This specialist firm made the Thunderbird nameplates - all in blue except pink for Lady Penelope - and has produced the plate for the newly-launched Sir John Betjeman for railway company, One. Chris Donovan, who runs the company, has been commissioned for all kinds of nameplates, from the poignant to the ponderous. He remembers making a plate called Sophie, in memory of a girl who had been killed on the railways. Another train was named after a driver who had died in a collision. As well as enjoying evocative names such as Tintagel, he recalls a freight company naming its trains after the women working in its office. And there have been outsized names for trains which have been so long that they're "more like essays". These have included the snappily-titled London Borough of Havering Celebrating 40 Years and the even more extended London Borough of Newham Host Borough 2012 Olympic Bid. There is one name that should be there, but for which so far he's never received a commission: Thomas the Tank Engine. Back in my student days, we travelled to Manchester to compete on "University Challenge". The Virgin train taking us there was named "Mission: Impossible". We lost. The day I saw 'BBC Points West' leading the 1630 departure from London Paddington to Weston with 'Top of the Pops' on the other end, quickly followed by 'Bolton Wanderers' on the 1635 to Manchester, I knew railway naming had gone mad. For heaven's sake, 'Eisteddffordd Genedlaethol' doesn't exactly roll off the tongue, does it. Whatever happened to using the names of racehorses? I rather like the name of the diesal that's normally parked at Woking station - "Vampire"
Here in Brighton the buses are also named, mostly after famous people; though apart from Winston Churchill, the names aren't particularly recognisable... perhaps it's an attempt to educate the many students living in the city? It had obviously been a long day when they finally got round to naming the "Blue Train" in South Africa. And for those of you who may be wondering, yes, it´s blue! Living next to the mainline station as I do, there are so many mundane names I get to see (Rodney is the least inspiring that springs to mind! ), but every so often there comes along a really evocative or powerful name. The best I have seen is "Quicksilver" which I think promotes the idea of speed and swiftness superbly. Planes - even commercial ones - also have names and not just in the recent past. In 1984 I flew back from Fuerteventura in a 737 called Bobby Moore. Locomotive naming by the train operators has certainly gone mad and lost all sense of direction. Let's get back to using themes for naming railway locos like towns and cities along the routes they run through, famous Royal Navy ships, aircraft, football clubs, counties, kings, castles or whatever but please let's keep each theme to a particular class of loco. Then they will have real interest and meaning once again. Oh yes and famous racehorses of which there are plenty. I remember clearly as a boy in the late Fifties and early Sixties the thrill of going on the family summer holiday on the 'Atlantic Coast Express' from Waterloo to Ilfracombe hauled by those magnificent Bullied Pacific steam locomotives all named after either Battle of Britain RAF Squadrons or Merchant Navy Shipping Lines was so thrilling. Now alas, all gone. I think naming a train (any name) is rather childish, and people who name them need to grow up (and the same goes for 'planes). Years ago, there was a train on the line from London to Bristol called Sulis Minerva. Coming from Swindon and travelling a lot I used to see it loads and thought of it like a good luck symbol. I moved up north recently but before that I hadn't seen it for about five years - what happened to it I wonder? Thomas the Tank Engine should definitely be a proper train! It would certainly get my vote! And can I also suggest Percy who was my next favourite character from those stories when I was a little girl? I named my kitten Percy when I was four but sadly he died! For those fans of Thomas the Tank Engine such as Amy from Durham can I suggest a visit to the Bodmin and Wenford railway as they not only have a blue tank engine called Thomas but also a little shunting loco called Ben which I believe was the engine that lead to Bill and Ben, the twin locos in the stories.